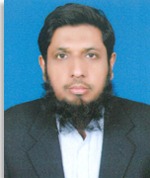 Dr. Zia ul Haq has obtained B.Sc., M.Sc. and Ph.D. degrees in Space Science from University of the Punjab, Lahore and M.S. degree in Telecommunications Engineering from London South Bank University (UK). He has shown his competence at international level in the fields of Satellite Remote Sensing (SRS), Geographic Information System (GIS), air quality monitoring and climate change. He has contributed number of research papers published in prestigious foreign peer-reviewed research journals with impact factor mostly from USA and UK, and one book chapter by Springer International. He is one of the leading scientists working in the field of climate change with particular emphasis on satellite remote sensing of trace gases and aerosols, anthropogenic gases emissions and long range transport of pollutants at South Asia level. He is also reviewer of several scientific journals of international repute viz. Atmospheric Research, International Journal of Remote Sensing, Atmospheric Pollution Research etc. Dr. Zia ul Haq also has significant contribution in fine and applied arts which is reflected by his five calligraphic and illumination exhibitions (three solo and two combined) some of which have been held at international exhibition venues such as Alhamra Art Gallery (Lahore) and Lahore Heritage Museum (Lahore). He has applied, to revive old scripts and illumination styles, precious stone pigments and real gold using a wide range of medium and techniques. In recognition of his artistic work, several TV packages, interviews, newspaper columns and magazine articles have appeared on national and international print and electronic media.